To Let £ 200	P.C.M. 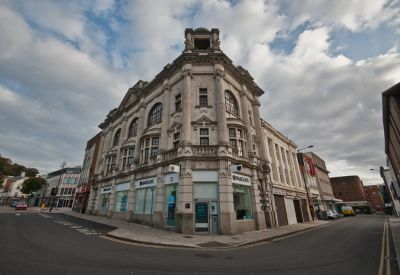 Situated on Union Street, the Mond Building occupies a prominent corner plot and is a minute walk from the Quadrant Shopping Centre. Neighbours include both local and national covenants and range from banking institutions, to retailers. The property comprises a ground floor retail premises with office space and ancillary stores to the upper floors. The upper floors are accessed by way of a communal entrance to the side and each office is self contained with use of communal WC facilities. The property benefits from mains electric utilities. No utilities were tested during the course of our inspection. Our clients Freehold interest in the office space is available To Let by way of flexible lease terms of which are negotiable. Rental levels start at £200 PCM. On lease completion, a 2 month bond is payable in addition to 1 month rent. We advise that there may be service charges payable in addition to the rent. The exact cost is to be confirmed. The Tenant is to be responsible for agency fees in respect of the letting. Costs are to be confirmed. Parties are advised to discuss the rateable value for each individual office suite with the local authority. Please contact the joint letting agents, Dawsons and CLC. Viewing is by appointment.